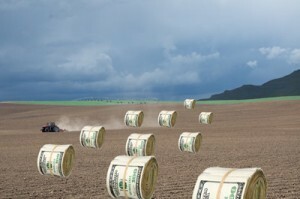 Home Environmental News Meet Your Taxpayer-Subsidized Farm Bill Billionaires! ‘There are no farms in Manhattan, but residents there have collected subsidies totaling nearly $9 million in the past seven years. Recipients also include Mark F. Rockefeller ($356,018) and David Rockefeller ($591,057). Yes, the Rockefeller family (Standard Oil, Chase Manhattan Bank, etc.). This is from a recent report by the Heritage Foundation titled, The Rich and the Famous at the Farm Bill Trough. This report illustrates that giveaways to agri-giants and fat cat bankers is the rule, not the exception. The looting doesn’t stop with bankers and agri-giants, actual members of Congress and their families collect these subsidies as well. Senator Charles Grassley (R–IA) has collected $955,192 in taxpayer subsidies from 1995 through 2012. Rep. Stephen Fincher (R-Tenn.), has received nearly $3.5 million in subsidies. The Agriculture Risk Coverage provision, also known as crop insurance, seems like a reasonable part of the bill that would protect farmers from damage to their crops from natural disasters. However this is hardly the case, crop insurance, is actually a revenue protection program that guarantees 89 percent of their Benchmark Revenue of the last five years. With prices averaging at record highs over the last few years any natural correction of falling prices will be covered with your tax dollars. Americans need to wake up. The fox is in the hen house and there are very few hens left to eat. We are threatened with force and violence by the government if we do not pay our “fair share.” Then the government takes this newly extorted revenue and gives it to their buddies. There is a term for what is happening here and it is most definitely NOT “paying our fair share,” it is called robbery. Simply because the IRS claims authority over you does not justify this theft. When will enough be enough? How much more blood and sweat can the government squeeze from the American people to fill their own coffers before we say no? One thing is for certain, as long as they are able to rob us, they will rob us. It is up to you and I to expose the state for what they really are, a gang of thieves, writ large. We need to stand up and say, I am mad as hell and I’m not gonna pay you anymore! Peaceful resistance and working outside of the state run economy by buying local and organic or growing your own, will be our most valuable tools in the struggle to end this thievery.